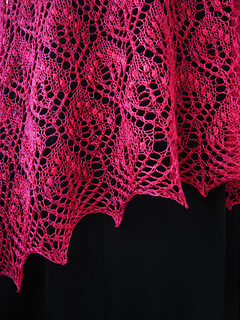 This triangular shawl starts with a cast on of only six stitches, and increases only along one side until it’s full width. 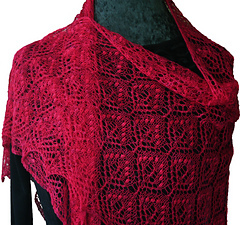 The shawl can be made in any one of the five sizes provided, or simply knit until you’re close to running out of yarn, or get bored. Then work the border until you get bored, or run out of yarn. Needles: US 4 (3.5 mm). Note: a good set of lace needles makes the world of difference when working nupps. 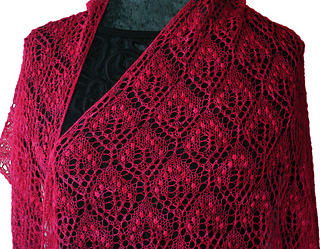 Gauge: 16.5 sts and 24 rows to 4 inches in stitch pattern, blocked. Skills: k2tog, ssk, YO, s1-k2tog-psso, 7-stitch nupps.